I slept comfortably late, until 7:00am. Heated up dinner leftovers for breakfast and toasted my last bagel. Washed it all up with the still quite warm coffee from my thermos, prepared the night before. Completed the breakfast finishing up my remaining orange, more to free up some space in my kayak than out of hunger. 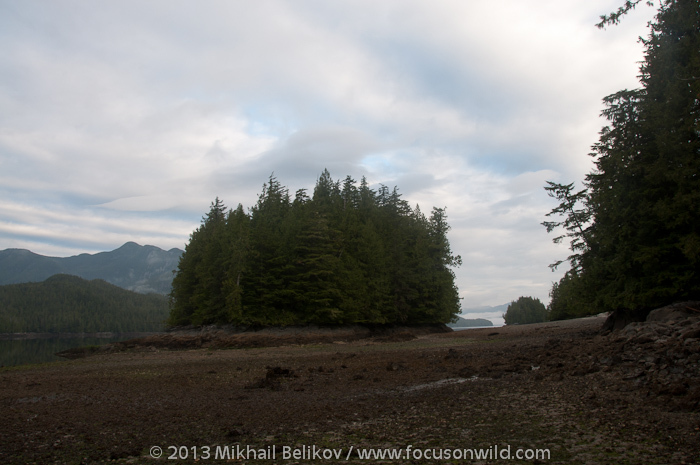 The tide was low and the whole area between my camp and the islet in front of it was lying bare. After leisurely loading up my kayak, I had departed at 2:00pm, when the tide had turned and started ebbing. 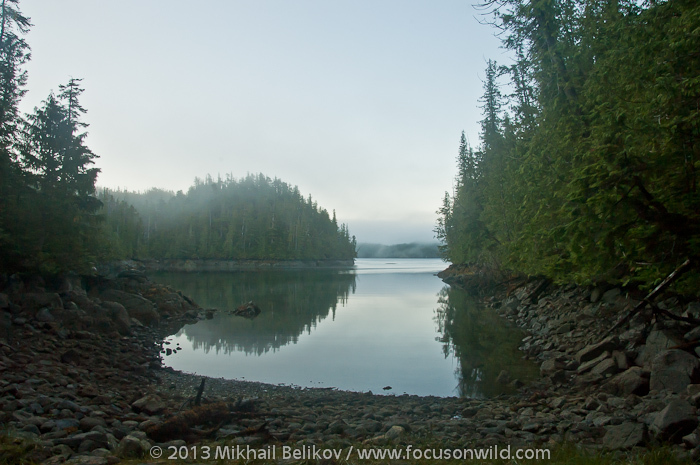 The area in front of my campsite was again covered with water, with only a small strip of the sandy beach visible, quickly disappearing as I was paddling away. A couple of hours later I was riding through Meyers Narrows -- as the name suggested, a narrow place in the passage where the tidal current was especially strong, flowing like a river. It was a fast ride; however, it did not last: soon, the passage had opened up again, and the flow became almost unnoticeable. Meanwhile, an initially gentle front westerly wind had started getting stronger, building up sizable waves with white caps. After two hours of struggling against the wind and the waves, with my speed reduced by a half, I had realized that reaching my intended camp on Milne Island today was very unlikely. The waves were getting bigger as I was moving closer to the passage exit: a wide Laredo Sound ahead had plenty of room for the sea to build up in this strong wind. Even if I had managed to reach the exit, I would not have been able to move any further in these conditions. I had checked the chart for protected bays ahead, preferably with tidal areas that usually indicated a chance for a flat patch of ground for my tent. 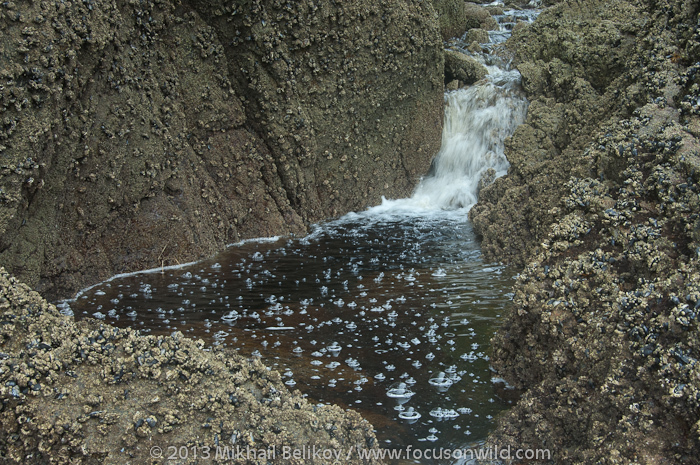 Corney Cove, a deep bay with a stream, about half an hour away, looked promising, and I headed there. 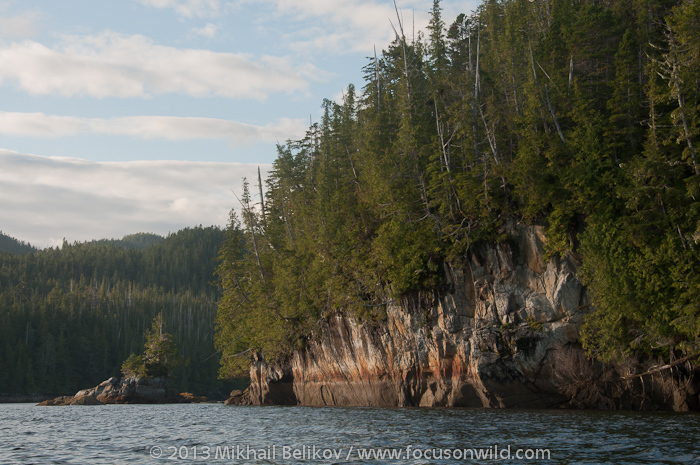 It was already close to 7:00pm when I reached a small islet marking the cove entrance. Once inside the cove, I could identify two promising places for a camp at its end. The one on the right had a fresh water stream, and I headed there. Unfortunately, the stream was emptying into the cove through a small waterfall. Although picturesque, it was making access to the shore above very difficult. The small bay to the left, on the other hand, had a gently sloped bottom and a tiny strip of grass higher up, also sloped and barely wide enough for my one-person tent. Not very comfortable, but acceptable for one night. Pitched the tent and placed several dry bags inside at the lower side of the tent, to keep me from sliding at night. With little time left before the sunset, I walked along the shore to the creek to get some fresh water for cooking my dinner. A grassy area along the creek, above the waterfall, had a clearly visible trail through it, quite likely left by a bear. A reminder to cook and keep my food well away from the tent. I had established my cooking and food storage area on a bay slope, among large boulders, and made pasta with cheese for dinner, followed by a cup of tea. With my thermos refilled with the breakfast coffee, I had connected all my dry bags storing food and other smelly items to a line attached to a tree, and clipped a bear bell on it. At least, I would get alerted if a bear decided to pay a visit at night. Was in my not very comfortable bed by 11:00pm. The plan for the day ahead was to skip Milne Island and get into Laredo Inlet staying overnight in Quigley Cove, a journey of no more than eight nautical miles, or four hours of paddling in calm conditions. However, it was important to get through the narrow Thistle Passage between Princess Royal and Hastings Islands at slack or with flooding tide, otherwise I would have to struggle against a strong current in the narrow areas. Much would also depend on the sea conditions in the six nautical miles-wide Laredo Sound. 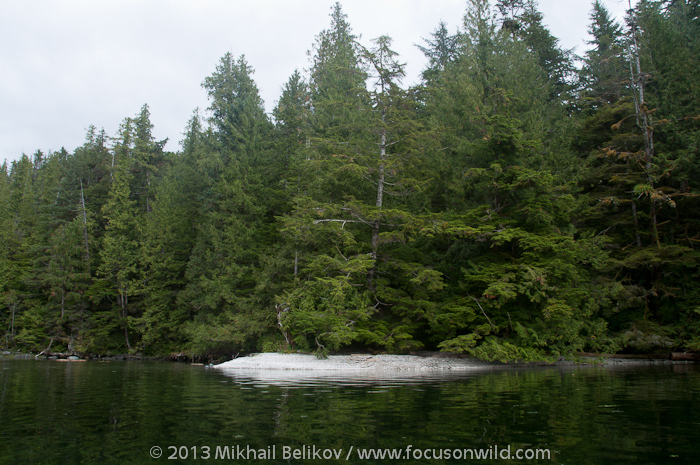 Although an exposed area that I had to cross after exiting Meyers Passage and before getting into a shadow of Milne Island was less than one km long, it could be impassable in rough weather.